Space exploration is easily one of the best ways to capture your kids’ curiosity in science. 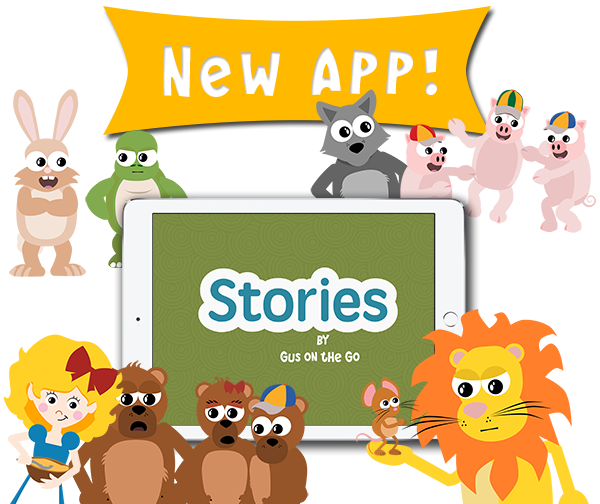 So why not combine our solar system and your target language into a single lesson? While diving into astronomy vocabulary may sound daunting, I came up with a simple approach and lesson plan. 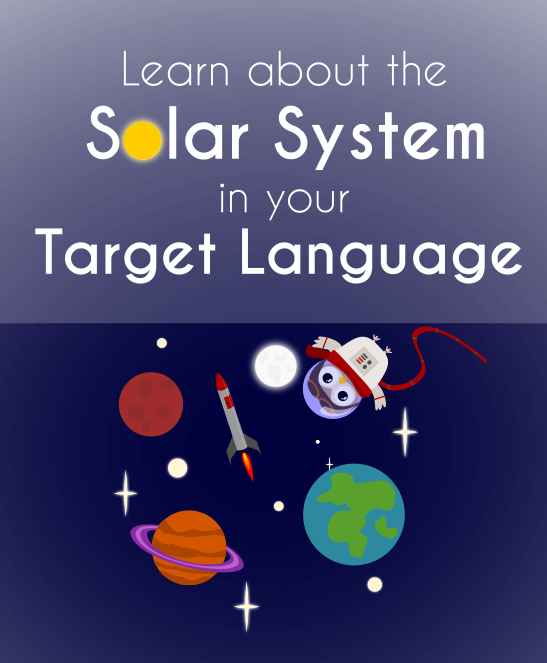 Learn a little about our solar system while building target language vocabulary. We started with a fun art project with the basic word found in every planet name, 星, which translates to star. I had created a worksheet that allowed my students (a.k.a. my kids and their best friends) to paint over the character, following the stroke order and also a star illustration. I encouraged them to use different colors for every character stroke, which also serves as another way for them see the separation of strokes at a glance. 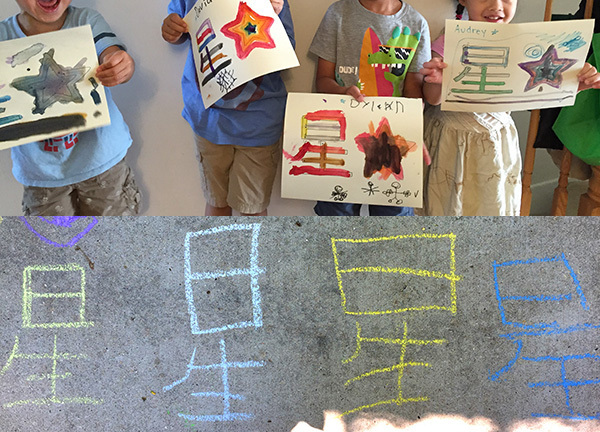 We even spent a little time writing the 星 character in chalk outside. Instead of regurgitating information about the planets myself, I showed my students (my kids and their best friends) a few youtube videos (in English) about our solar system. It was really important to me to use video to show the huge expanse of our solar system, the planets in rotation and their orbits in action. As the videos introduced each planet in order of proximity to the sun, I asked my 4 students to pick a planet from the set of inner and outer planets, and gave them planet cards to hold on to. Once their chosen planet was introduced in the video, I paused the video and asked them to place their planet card on a black cloth with a sun. This is where I took the opportunity to introduce the Chinese names (in Cantonese for my kids and Mandarin for their best friends). And when simple descriptors were mentioned in the video, I would stop and reinforce it in Chinese. For example, Neptune can be described as “blue”, “cold”, “farthest” while Mercury is the “closest” and “smallest”, Mars can be described as “red”, Venus is the “hottest” and Jupiter is the “largest”. This is an incredible way to reinforce words that they already know, but now they could apply it to planets. Other fun vocabulary ideas would be to include “space”, “astronaut”, “comet”, “solar system”, “asteroid”. You can even sort the planets by size or by distance from the sun and use ordinal numbers “first”, “second”, “third”, etc. Afterwards we went outside with sidewalk chalk and our planet cards and here’s where they had the most fun! I placed my sun card in the middle and asked them to draw orbits around the sun and place the planets in the correct orbits. They worked together, still taking ownership of the planets they had initially chosen. All in all, this was a great morning of learning for my 4 little students. They worked together, they remained engaged and asked me endless questions in English and Chinese! The idea is to keep the vocabulary simple yet relevant. Sure, my students won’t likely be using planet names and other astronomy terms in our target language on a day to day basis, but they most certainly will use the basic descriptors. Additional Resources: Learn more about the names of the planets in our solar system in different languages! 1. Spanish (Spanish Playground) – a fantastic list of vocabulary and resources for learning about the planets in Spanish. 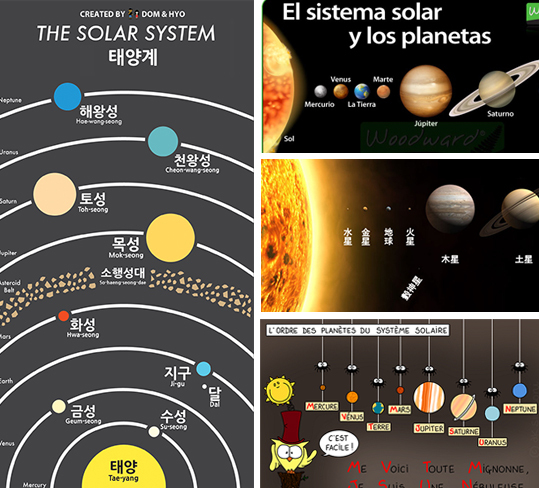 Spanish.cl also created a graphic in Spanish as well as listing basic characteristics of each planet (in Spanish). 2. French (anneka.fr) – This is a super cute drawing of the planets in French as well as a mneumonic to help you remember their names. 3. Chinese (En Route to Fluency) – This is a fantastic explanation of the origins of the planet names in Chinese. Transparent’s Blog also does a great writeup of different Chinese characters used to name planets and how they are related. 4. Korean (Dom & Hyo) – Dom and Hyo make THE BEST Korean language infographics. Their Korean language space illustration is my absolute favorite!